Anxiety can play tricks on you! It can fill your mind with thoughts that aren’t even true and overwhelm you with feelings of unwarranted guilt or fear. An anxiety disorder has the ability to make the best situation completely exhausting – mentally and physically. It doesn’t matter how severe your anxiety it, anyone with this disorder can struggle with these “out of the blue” feelings. 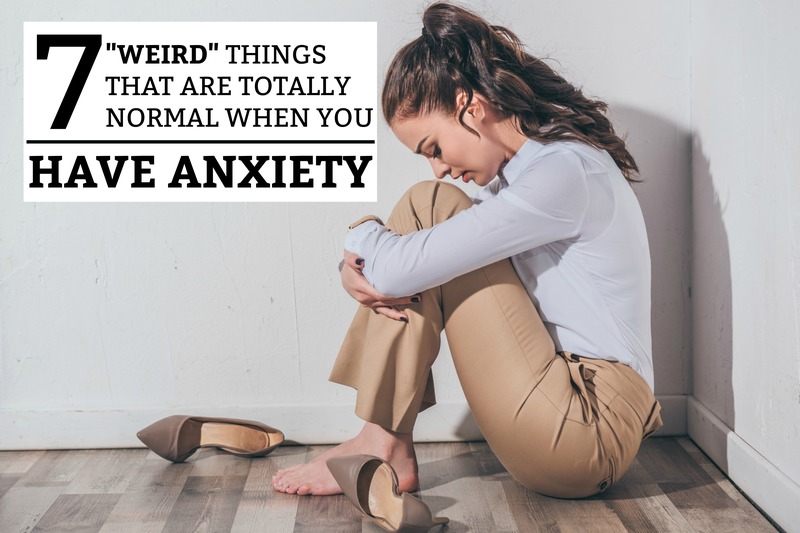 Below are 7 “weird” things that are totally normal if you have anxiety. 1.) You sense danger – out of nowhere! There may be no threat anywhere close to you. But suddenly, you are overwhelmed with a feeling that something is about to happen! Fear is usually linked to a real-life event – a large bill, final exams, a stressful relationship, etc. But with anxiety, the fear is completely unrational – and uncontrollable. Your mind is always racing ahead to help fill your mind with “worse case scenarios”. In response, your body triggers your “fight or flight” response – sending your anxiety through the roof! People who don’t have anxiety cannot wrap their minds around what this feels like! It feels like you are carrying around 3 cement bricks on your chest – every single moment of the day. This also makes you feel like you can never get enough air in your lungs. It’s not a panic attack, but it feels like you are on the verge of having one if you are triggered. When you start feeling overwhelmed by these feelings, try out the mediation apps Calm or Headspace. They can do a world of good if you are consistent. …sweating, muscle tension, chills, chest pain, nausea, diarrhea, trembling, etc. Have you ever started heavily sweating when your anxiety gets triggered? I have! Anxiety can take a toll on your physical health too! Your mental and physical health are directly linked, so it is no surprise that anxiety can sometimes affect your body. Anxiety often tends to amplify physical symptoms. This is one of the reason panic attacks can feel so much like a heart attack! The key is to stay calm and not let your mind convince you that you are seriously ill. If in doubt, always see a doctor. But eventually, you should be able to self-identify when it is a physical illness and when it is your anxiety disorder. Anxiety and insomnia go hand in hand! You’re exhausted, so you lay down in hopes that you can sleep. But your mind suddenly goes crazy and won’t let you doze off! As you lay there in the dark, all you can do is think about everything in life that stresses you out – all your fears, insecurities, doubt, and loneliness, etc. Although your body wants to sleep, your mind is still very-much awake! As stated in point #3, you mental and physical health are connected. Anxiety can weaken the immune system dramatically – if it is left unaddressed. It can put so much stress on you that your body releases a stress hormone called cortisol. As a result, you may find yourself catching more colds and flu’s than you use to. Gaining weight isn’t always a bad thing! Although anxiety does not directly cause weight gain, there is a direct correlation between weight and long-term anxiety. The three main causes are cortisol, eating more than necessary, and bodily inactivity. As mentioned in point #5, cortisol is a hormone that is released during times of stress. It causes fat to build up around the midsection and is the #1 reason why stress often causes weight gain! Excess eating and inactivity go hand in hand. When you are stressed out, food can be a coping tool that makes you feel better in the moment! Anxiety can be exhausting, making you want to sit around and take a break! Studies show that when you are stressed out, the first thing to go is exercise. Every person reacts to anxiety differently, so weight gain is not always a symptom. Anxiety triggers your body to start pumping adrenaline, which surges your energy in the moment. Your mind races, your heart pounds, and your reactions become faster. But then this surge of physical energy goes away and you are left with a major absence of energy! You feel like you were hit by a train and need to lay down for a week. These energy surges and crashes are an unwelcome part of an anxiety disorder. But you never know when they are coming – it just takes a trigger. Positive Attitude and Reasonable thinking many times work better than medication. Absolutely, Luis. Letting your thoughts get away from you and falling into the habit of negative thinking can cause anxiety! Good thoughts! You’ve already got a business website but, alas, it isn’t getting visitors and isn’t growing your company. This is what happens with ecommerce every single day.